"Us elves like to stick to the four main food groups. Candy, candy canes, candy corn and syrup." Every Thanksgiving I watch a sappy, winsome holiday movie that somehow brings with it the holiday spirit. It's a personal tradition that may seem silly, but it means a lot to me. The only bad thing is, for the past several years I have been relegated to the same films over and over, and that, unsurprisingly, grows tiresome. So it is with a certain amount of trepidation that I greet each Christmas with the hope that something new and terrific will come along, and it has, this year, in the lovely little package of Elf. Told with an unabashed love of the holiday season and an absolutely fantastic performance by Will Ferrell, Elf is one of those Christmas films that not only packs a lot of heart but a lot of comedy also. The plot is ludicrous, which should always be the case in a film like this, and the performances and the witty script are enough to make you forget about those sorts of things anyway. Buddy the Elf (Ferrell) is the biggest and best known elf at the North Pole, and while that may at first seem like a compliment, it really isn't. The reason he towers above all of the other elves is because he is in fact a human, brought to the North Pole after he stowed away in Santa's gift bag. Raised by Papa Elf (Newhart), Buddy doesn't quite fit in, and slowly he is beginning to realize it. This leads him on a trip to New York where he seeks out his biological father Walter (Caan), a children's book editor who is in desperate need of a hit. As Buddy begins to interact with Walter he also meets an eclectic group of friends including a cute shopgirl named Jovie (Deschanel), his stepmother Emily (Steenburgen), and his new stepbrother Michael (Tay). But there are also the requisite moment where Buddy has to save the day and rescue Santa and Christmas and some other carved in stone scenes. There is little doubt as to what will happen but that really isn't the point. From the outside Elf looks like a film that would be likely to fail, with the aforementioned premise and some truly strange casting—James Caan in a broad family comedy, or better yet, Bob Newhart as Papa Elf—yet director Jon Favreau and writer David Berenbaum have crafted a sort of near masterpiece. So much of the pleasure they obviously derided from the film is evident in every step along the way, and Ferrell's performance has enough joyous energy to melt the coldest of hearts. By overloading the film with humor and emotion Favreau wisely eschews any obvious gags and instead lets the story build with several outstanding scenes that place Buddy in strange situations. In essence this is Big with an elf, but Favreau never really drills the fish out of water aspect home too hard, and thanks to Ferrell's performance we kind of start to believe Buddy as a child experiencing things for the first time. The interaction between Ferrell and his co-stars is another treat, as he and Caan play off of each other wonderfully and Caan shows off some outstanding comic abilities. One needs to look no further to the first family dinner with Buddy, Walter, Emily, and Michael that is both touching and hilarious. Sure the film is sappy, and the �lets all believe in Christmas again� thing has been done time and time again, but here is it done with such carefree abandon that it ultimately wins you over. This is a terrific film that deserves to become a modern holiday classic. Image Transfer Review: The 1.85:1 anamorphic widescreen transfer (a cropped pan and scan image is available on the second disc) is not of the quality I had hoped, but what is offered is decent. Sharpness and detail are each very well done, with the film almost popping off of the screen, colors are rich and vibrant, with the bright whites of the snow especially showing up very well. But the transfer does show a few instances of edge enhancement. While they are never immediately noticeable, it happens on more than one occasion. Audio Transfer Review: The Dolby Digital 5.1 mix for Elf is more active than most comedies, but anyone looking to shake their house should look elsewhere. Ambient sounds and some nice directional effects are noticeable in the rear speakers, and the mix does a nice job when it comes to the split surrounds. Dialogue is nicely done with good depth and no distortion, while the left and right speakers do a good job of filling out the soundfield. 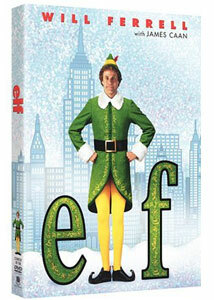 Extras Review: New Line has released Elf as a part of the Infinifilm series, a grouping of DVD releases that offer in-depth bonus material. That said, Elf has an enormous collection of extra material spread across two discs with the first housing the majority of the material. Leading off are two audio commentaries, the first by director Jon Favreau and the second from actor Will Ferrell. Ferell's track is not as humorous as one may expect. He mainly focuses on the making of the film. He does discuss his costars as well as a few behind the scenes anecdotes, topics which are each mildly humorous, but those expecting a laugh fest will be disappointed. Favreau's track is more technical, though he livens things up with a large dose of humor. The track deals a lot with the casting and shooting of the film and how he went about finding the style, as well as some of the slight changes in the script. Also on the first disc is a collection of eight deleted scenes, each with commentary by Favreau. There are a few scenes in which Ferrell offers some large laughs, but substance is lacking. A fact track is also included that allows you to go to a special feature related to the scene that is being shown. The showcase piece of the set is an hour-long documentary that is available for viewing by itself or in four separate parts. The documentary takes its viewer from start to finish, and offers a visit with Ferrell on the set and follows him around during a normal day of shooting. The piece also features interviews with the cast and crew, as Favreau and the cinematographer, production designer, and screenwriter discuss their approach to the movie. The piece also follows the post production phase as we see the film being scored, edited, and the visual effects being done. This is a surprising piece that is an informative look into the making of the film. The second disc boasts a wide array of games and featurettes aimed at a younger crowd. Four featurettes are available: Kids on Christmas, a six minute long look at various children talking about the holiday and traditions. The next is Deck the Halls, a discussion that shows the lengths people go to when they decorate their houses. Santa mania talks about the love people have for Mr. Claus while Christmas in Tinsletown focuses on how Hollywood as a community treats the holiday. Finally Elf Karaoke and a collection of read along stories round out the bonus materials. If, before its release, someone were to ask me if I thought Elf would have made my top ten list for 2003 I would have looked at them as if they were crazy. Now, I will gladly admit that this is a treasure that packs more heart than any other holiday film likely be released this year. Highly Recommended.